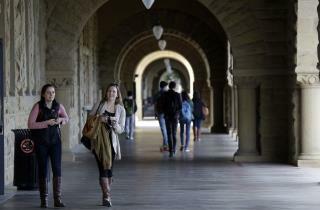 (Newser) – Stanford University is launching a program it's calling the "largest single increase in student financial aid in Stanford's history," and it has Nike's chairman to thank for the lion's share of it, NPR reports. Philip Knight, also one of Nike's co-founders, has pledged $400 million, which is more than half of a $750 million endowment supporting the new Knight-Hennessy Scholars program. The scholarship aims to attract students from around the globe with demonstrated "leadership and civic commitment" to solve some of the world's biggest challenges. Next on Newser: Let the Speculation Begin: Who's Trump's VP? Wealthy people 'donating' money to ensure other wealthy people stay wealthy. That's rich.